Studio flat with sea view, in the heart of Scopello. The studio is comfortable and fresh. It does not have air conditioning, but it has a powerful fan and a very big window where you can really enjoy the inside and the outside of the apartment. The kitchen is basic and comfortable. The bathroom have a big shower and is very relaxing. You are welcome also in the winter time because we have a pellet stove (MCZ, clean air certification) so you can enjoy Scopello in the calm periods. From the center of Scopello in only 10 minute you can find more beaches.. 15 for the return for a bit of uphill. The natural reserve "Lo Zingaro" is just 1 km far away. My family is a fantastic mix between south and north. Me and my sister was born here and we grown in up in Trentino Alto Adige. I moved ten years ago in Sicily because is my home and where I feel free. Is a family house we restore two years ago so is all functional and made made with love. Some hosts told me they felt in an island in the apartment, from the bed you will see a suggestive panorama with a big palm tree. Out side of the balcony you can feel the sea breeze and the view up to the "Natural Reserve of Zingaro". Important thing... never enter inside Scopello with the car otherwise policeman they make a fine. There is both free and pay parking. When we will meet i show you the right place. L'appartamento è situato all'ultimo piano del palazzo ed è ben fornito di tutto il necessario per passare una bella vacanza in una cittadina davvero suggestiva. Dal balcone è possibile godere di una vista molto bella, sulla sinistra si vede in lontananza la riserva dello zingaro. Dal paesino è possibile anche raggiungere a piedi la tonnara, in un quarto d'ora con un buon passo (al ritorno c'è un pò di salita da fare). Un unico appunto per il padrone di casa che è stato davvero gentile e disponibile, forse in casa andrebbe aggiunta una bella lavatrice o almeno un paio di bacinelle per lavare a mano :-) Concludendo, tengo a raccomandare una visita di qualche giorno a Scopello e perché no, a casa di Giuseppe! If you’ve found this place you’re one of the lucky ones. 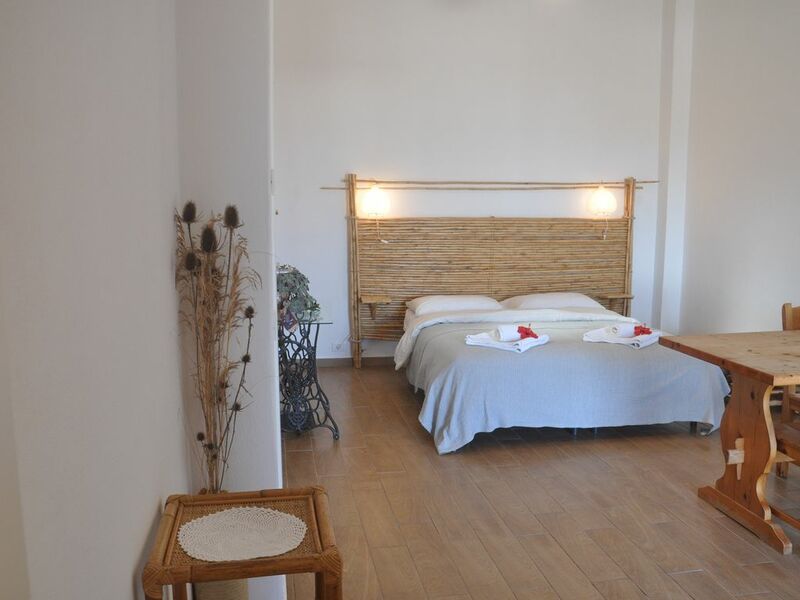 Great studio with a lovely terrace and everything you would need for a good length stay in Scopello. Quiet, clean and tranquil. The studio is a short walk to many beautiful beaches, including the Tonnara and also a short drive to Zingaro National Park. It’s is a family owned house, very sweet and special souls whom I’m grateful I got to know during my two week stay - they also happen to have the best bar in town. Scopello is a emotional mix between sea and the mountains, you can relax or make your adventure. We are in the middle of the two pricipal aeroport (Palermo 53 km Trapani 63km). Arriving to Scopello, only your fantasy can stop you, snorkelling In one of the most beautiful seas of Sicily, many types of boat excursions, trekking, quad, bike, climbing and...many different beach! We have the first Natural reserve in all Sicily "Riserva dello Zingaro" with her fantastic view from the top to the caribbean sea with her beautiful coast. You can't miss the typical Sicilian food, lots of different desserts, all the best mediterraneo fish, pane cunzatu (typical Scopello sandwich) now famous in all the Sicily, special ricotta cheese from Castello di Baida (just 5 kilometers far away). There is more and more around here, but leave you the rest of the research.